The hypnotic music of Steve Reich has a dialogue with that of Pérotin, Pink Floyd and Stockhausen. The public is in the heart of the creation of Jonathan Bell which encloses this show. CONSTELLATIONS traces out a poetic and oneiric path between dramatic expression and a wide variety of musical styles: a resonant and visual constellation of suns, suspended and evocative like a lunar image in a dreamlike moment. 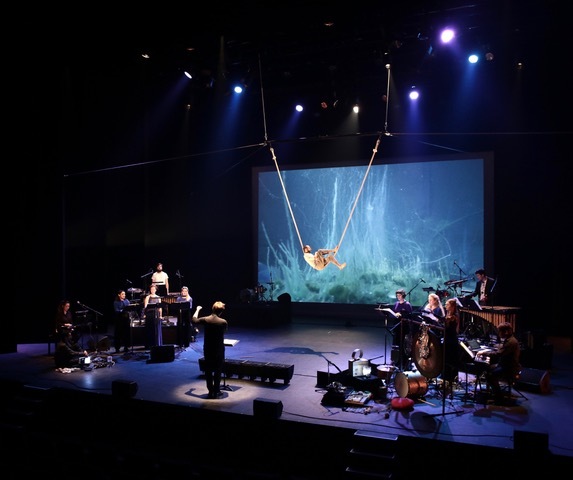 CONSTELLATIONS is a story of encounters: initially between the Links and De Caelis ensembles, then between Pérotin’s Ars Antiqua music and that of Steve Reich, to create a spellbinding and original work incorporating music, circus and video. Bringing together musicians and visual artists, the Links Ensemble has set itself the task of inventing new, often participative concert formats. In their desire to encourage amateur choruses to perform contemporary music and make it more fun and more accessible, it was only natural for Links to come together with the De Caelis Ensemble, a specialist in medieval music and contemporary creation. The two ensembles will be presenting Proverb by Steve Reich, with forays into Pink Floyd and Stockhausen. There will also be modal improvisations inspired by Pérotin’s Organa and Jonathan Bell’s piece Le temps des Nuages, composed for the two ensembles and an amateur chorus to a text by Michel Onfray. Taken from his book Recours aux forêts, published by editons Galilée, it is a poetic and philosophical meditation on the need to set one’s destiny in nature and the cosmos. Pérotin’s music dazzled the West by its inventiveness. The use of rhythmic forms, numerous repetitions and imitations, gives it a stimulatingly exhilarating, quasi-hypnotic quality. Clearly, a fertile source of inspiration for Steve Reich. At IRCAM, Jonathan Bell has developed a process that allows an amateur chorus to receive musical instructions via a mobile telephone, thus gaining access to the creative process without the often formidable barrier of score reading. Specifically created for the performance, the chorus is dispersed among the audience. The spatialised sound leaves the listener immersed in a unique experience. To lend image and substance to the musical programme, the artists’ collective has devised a world in motion. An ethereal universe comprised of fascinatingly spectacular poetic colours and forms that bring together the aerial choreographies of Circus performer Julien Cramillet and the chemo-hypnotic videos of visual artist Hicham Berrada created in real time on stage. CONSTELLATIONS will explore all the theatre’s public areas to offer an astonishing sensorial adventure that has to be felt and experienced in total immersion.